Bottom 7.5 fuse keeps blowing and now fuel pump isn't working. K100-forum.com » Technical, repair and troubleshooting » Electrical » Bottom 7.5 fuse keeps blowing and now fuel pump isn't working. Bottom 7.5 fuse keeps blowing and now fuel pump isn't working. Are these too the same problem? As in, does the fuel pump need that fuse to power (spin)? What can I do to figure out why that fuse keeps popping? The #7 fuse feeds the horn relay and the flasher unit. It should have no bearing as to the fuel pump working or not. Check the 4 pin plug that goes to the tank they are noted for problems, you may need to squeeze the female pins so they make good contact or just cleaning it may work. I have replaced two of those over the years with 4 pin 6mm automotive type connectors and have had no more trouble. As for the fuse blowing you will need a good circuit diagram to chase the problem down. If you need one PM me and I will give you a link. I'll try the 4 pin under the tank in the morning and see if the pump will spin. She just slowly choked out and died. Gas was pretty low so I hoped that was the culprit turns out to be more. Please do send the diagram link for the fuse when you get a second. Thank you so much Rick. The fuel pump runs on fuse #6, which it appears you are missing. @MikeisonTV wrote: Bottom 7.5 fuse keeps blowing and now fuel pump isn't working. Are these too the same problem? As in, does the fuel pump need that fuse to power (spin)? I think Mike is referring to the "bottom 7.5amp fuse" which is #6 (the missing one). If this is the case then the fuel pump windings or fuel level sender may be shorted. Fuse #6 also goes to the temperature controller. Try pulling the temp controller first and see if the fuse blows. Then disconnect the pump or visa versa. It's likely going to be the pump. When did you last change the fuel filter? To test the fuel pump you can jump 12V directly to it. The smaller diameter terminal on the pump is 12V+. Probably a good idea to make a point of not creating sparks in the fuel tank when doing this. i.e. Connect leads to the fuel pump first, then your power supply outside of the tank. EDIT: due to kennybob's post being completely altered, I've deleted my response because it was not relevant. @kennybob wrote: The radiator fan is likely locked up and the stall current is blowing fuse #6. The fan motor is protected by fuse #7, beside the fuel pump fuse #6 protects the PCB inside the temp management relay. I meant to update sooner. RICK nails it again...tighten up the 4 pin connector under the tank...she fired right up. 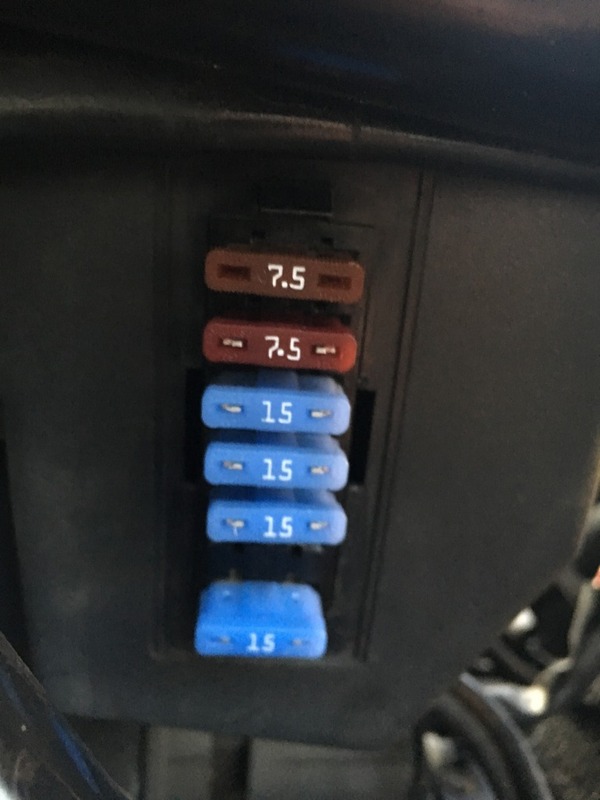 @kennybob wrote: Just to quickly test if the pump is working and to avoid sparks in the tank, with the key off, you could put a jumper wire from the right-hand side of fuse 4 to the left side of fuse 6 to put power to the fuel pump. This is a test, it is only a test. Do not try to operate in such a manner. The proper way to test the pump is to isolate it first, away from the circuit that's causing the short. In any case the fuse would blow straight way again so you'd be none the wiser. Don't even think about trying that without a fuse. @MikeisonTV wrote: I meant to update sooner. RICK nails it again...tighten up the 4 pin connector under the tank...she fired right up. most often its the simple solution. Onya rick. So whats causing the fuse to blow? 3: the pump fits super snug in the sleeve, the sleeve then super snug in the gutted BMW pump housing. Since the black rubber on the pump mount has been falling apart over the years...I cut the "distended rubber off at the bottom. I added a screw tightening o clamp to the top for added security. @duck wrote: To test the fuel pump you can jump 12V directly to it. The smaller diameter terminal on the pump is 12V+. That's exactly how I did it. I clean the pumps using the same DIY method used for cleaning the fuel injectors.